Christmas Eve is finally here, and while it seems like it was just Thanksgiving, these last few days felt really long, for some reason. We spent the weekend running last-minute errands, celebrating Ryan’s birthday, and enjoying the season and the cold weather. Our furniture arrived last night, an early Christmas present, so we are breaking it in and lounging around. I didn’t send out Christmas cards this year (something had to go, along with that monstrous tree), but if I had, the picture above would have been a contender. 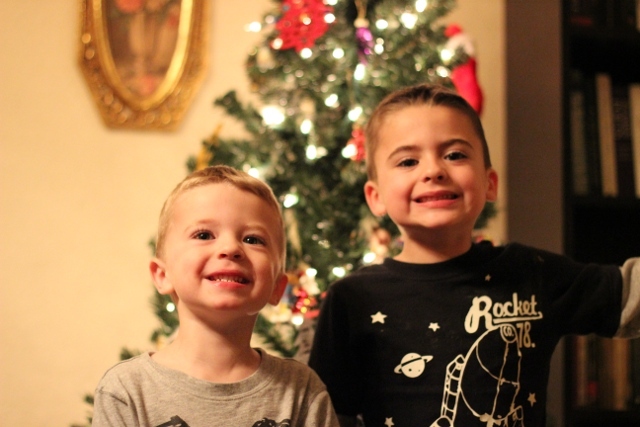 This is from the night we decorated our new tree, and the boys look so cute, even if they’re looking in two different directions. Oh, well. Tonight, we’ll put out the toys and fill the stockings after the boys go to sleep, and then we’ll celebrate with my family tomorrow. It should be a quiet and relaxed Christmas, and those are my favorite kind. I’m taking the rest of the week off, but I’ll be back next Monday. I hope you and your family have a wonderful holiday and enjoy this time together! See you soon! Quiet and relaxed…hmm. Relaxed, yes, but probably not quiet. You know it’s our family getting together, right? Love you and looking forward to seeing you! SO CUTE! I can’t wait to see these munchkins! Thank you! They are excited to meet your little guy! adorable boys, Catherine. wishing you and your family a happy, healthy, and prosperous New Year! Thank you, Donna! Have a wonderful 2014! I’m sorry to admit this but, I just cught up on your blog after a long time away. Love all the gorgeous pics and interesting topics. I want some of the pics of you and the boys. R also, of course. Fun to be caught up again.